My bookshelves are filled with old books. Authors shared riveting human connections with animals. I grew up at the edge of a city and ventured to wild country two blocks away. That countryside had scattered fallow farm fields nestled among active croplands in a flat open landscape that stretched for miles. I read fiction stories about dogs, a boy, and their adventures in the wild but my experience was hunting quarry in the fallow farm fields. The quarry was butterflies, frogs, and a lone big tree that could be climbed. I resorted to fictional books for connections with large wild creatures that did not live in my neighborhood. This duck is known as a surf scoter. 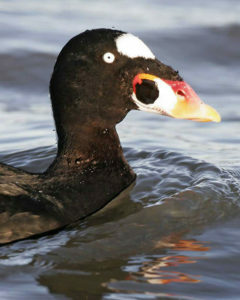 The male’s strong head pattern earns the species the hunters’ nickname of “skunk-head coot.” Photo from audubon.org. By middle school age, I was reading non-fiction about animals and developed a sense of purpose to share the world with them rather than usurp it from them. I had yet to become a naturalist or spend time in truly wild places. By age 15, I was working during the summer at a Boy Scout camp, living in a tent, and exploring wild woodlands at the scout camp. The world of discovery unfolded as I followed animal trails, stumbled upon deer bedded in bracken ferns, and found a skeleton that challenged me to determine what caused the animal’s death. I still have that deer skull and bones I found in a bog in 1962. I determined it got mired in the muck and could not free itself. It is a prized possession I often show visitors. Early connections with nature developed mostly through exploratory adventures. As my curiosity expanded, I needed help. Books became important. I bought my first nature field guide when I was 15. It was a late start. My exploration was limited to places I could reach by walking or biking. I had an opportunity that many kids did not. Our family took a trip to western national parks when I was eight and again when I was twelve. It was on one of those trips I decided to become a park ranger. I needed to absorb as much nature niche knowledge as possible. I did not know how to study wildlife. New books have the latest information and field guides have improved in many ways. The newest books are concise with great photographs but many do not retain the flavor of old books that have detailed observational descriptions written by early authors. I was told recently that books are a thing of the past because technology has made the information available electronically. I disagree; books are not a thing of the past. Most old books by nature writers are not available like popular novels for MP3 players or other electronic means. Old natural history works that can be held in hand contribute a foundation for present day books. They can often be found inexpensively for sale online. I just read a great new engaging book titled “American Wolf” about the reintroduction of wolves to Yellowstone, but old books like Adolph Murie’s about wolves are indispensable and not available electronically. Old books give us perspective for how our current knowledge developed. They offer extensive descriptions of animal behavior and the author’s personal relationships with their surroundings. Perhaps authors had long hours by campfire light to write details of the day’s events. Today, we have daylight 24-hours a day in lighted rooms if we want. We can lodge in motels and seek entertainment after dark. We do not need to spend hours by firelight writing. Motels, TV and internet were not available to Lewis and Clark as they worked their way west describing species and recording detailed descriptions of the landscape. 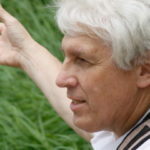 Edmond Way Teale, Sigurd Olson, Ann Zwinger, Henry Beston, John Muir, John Burroughs, Ernest Thompson Seton, are some authors that will take you on journeys like you have never experienced. Old books take you into historic wild places. Henry Beston’s wrote about the skunk coot in The Outermost House. I could not find the old name in recent books. I have an old 1904 bird guide that pictures them. They are now known as surf scoters. Old books are not a thing of the past. They are a connection to the past and are a wonderful read. Let their stories take you into the wild country.